Back in 1991 one of London's best established (and arguably "best") Folk Clubs was the Chestnuts Music Club which had started around 1978 in The Chestnut Tree pub on Lea Bridge Road but had moved around various venues over the years. That Club was the latest in a line of Folk Clubs in the Walthamstow/Leyton area dating back to the heyday of the sixties, such clubs as the Tower, The Three Blackbirds, The Navvy Boot as well as The Chestnuts which has now ceased, are fondly remembered by many local enthusiasts and artists who performed at them. The Hale End Clubs first leaflet. Click for a larger image. 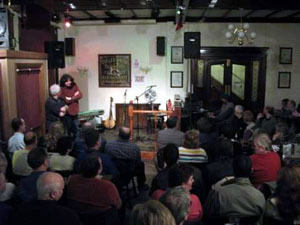 By 1991, however, the Chestnuts had grown into a relatively large, more concert than "traditional folk club", venue and a number of people decided they would like to establish a club closer to the older style of club in a more informal (but not "amateurish") setting with main guests booked plus local and visiting performers encouraged to take a turn from the floor. So in September of that year Gail Williams and Jim Younger, Kevin Sheils and Ken and Sue Lees set up the Hale End Folk Club at the County Arms, Highams Park with the help of a number of enthusiastic locals, many of whom are still involved in the club to some degree. The club opened on Thursday September 12th 1991 with Dave Burland as the Guest Artist. Other guests who appeared in that first programme up to the end of the year included John Foreman, Chris Wood, The Rakes with Freddy McKay, Ray Fisher, Reg Meuross and Martin Carthy. All of the original founders were regulars at the Chestnuts, in fact Kevin was one of the three regular MCs there along with Chris Pitt and Keith Rusby, and all continued to support that club as well as the new one. There was never any intention of competing with the Chestnuts but rather complementing each other and the two clubs worked well together over a number of years, even being jointly involved for a while in promoting the monthly Walthamstow Barn Dances at the Assembly Room, which had a successful spell around the mid 90s. The nature of the licensing law at that time meant that the club had to be members and guests only (a situation that continued until relatively recently) and potential members could register for the Thursday Club at the Chetsnuts on the previous Sunday. The Club went from strength to strength and towards the end of the century Ken and Sue gave up their direct involvement in the club and the formal organisation was taken over by Frankie and Terry Cleeve. Frankie had by this time become an important member of the team both as a singer in various combinations and as a musician (fiddle) who played solo as well as in the club "band" and in various line ups. However after a couple of years Frankie and Terry found that they were unable to give as much time as they would have liked to the club organisation and there was the possibility that the club might have closed. Kevin asked Ken if he would like to return as Club organiser after his break and Ken agreed. Circumstances, however, dictated that a move away from the current venue would be required and a new home was found at The Old Rose and Crown, Walthamstow where the relaunched Old Rose and Crown Folk Club opened in January 2002 with Martin Carthy as the Guest. Ken Lees had been the founder in the 70s of the Florence Folk Club and The Islington Folk Club both of which had a resident band who performed the role of playing at the start of the evening and during the interval to provide entertainment throughout the evening. Ken was keen for this to continue and that situation has continued to this day at various levels of formality and informality. A Poster for the 2006 Christmas Party - A Music Hall Extravaganza! Click for a larger image. The club has had a number of successful years since the relaunch and gradually the name migrated from The Rose And Crown Club to Walthamstow Folk as the organisers agreed that having the club name too closely linked to the pub name could be too restrictive, and confusing if a change of venue was required. This had happened with the Chestnuts Music Club which had started out at the Chestnut Tree but over the years had moved around a number of different pubs ending up at The Heathcote in Leytonstone. The club logo from the mid 2000s to 2015. As mentioned above the club used to meet on Thursdays as Sundays were taken up by the Chestnuts however, since that club had closed some years previously, it was decided in 2004 that after the summer break the club would move to Sundays. This would avoid the clash of days with the Islington Folk Club which also met on Thursdays. In 2003 Russ and Claire Chandler first came to the club and soon Russ was a regular performer and along with Claire was helping out with a number of the organisational functions. It was logical then that when Ken and Sue Lees decide in January 2006 to give up their involvement that Russ and Claire would be asked to become more formally involved along with Kevin Sheils and Sandra Murphy and these four now fill the main organisational roles at the club, with the help of our enthusiastic regular supporters. In September 2006 the club moved yet again The Plough Inn in Wood Street E17. The venue was a little smaller than the Rose and Crown and the club adopted the use of a PA on most nights. The Club spent just over 4 good years there but changes in the management and use of the pub necessitated yet another move at the end of 2010. A busy night at the Plough Inn. Fortunately, in the interim, our previous home The Olde Rose and Crown had come under new management and had become a true centre for artistic activity in the area, so in January 2011 we returned to what has proved to be one of the most successful phases in the club history, with the welcome support of the pub management. Whilst still at the Plough the club started the tradition of closing the season in June with a special evening showcasing lesser known, and often local, talent that had come to our attention in the previous year. We called this regular event "Futureproof". We see community involvement as an important part of our role as a folk club. 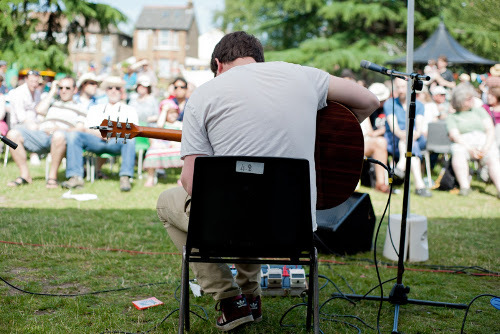 Whilst at the Rose and Crown we were asked to help the Friends of Stoneydown Park, a local community group, to stage a free folk festival in the Park at the end of June and this has continued for five years and now incorporates the "Futureproof" event. Also at that festival we are pleased to offer a showcase spot to one of the finalists at the St Albans based New Roots event. Stoneydown Park in 2013. Picture courtesy of Adrian Callaghan. We are also pleased to contribute an evening a year to The Stow Festival which happens every September and is becoming one of the countries most exciting urban festivals. It's a great opportunity to reach out to the broadest possible section of the community. Our contributions to Stowfest have included a rebooted Cosmotheka featuring Dave Sealey and his son Dan, a tribute to the songwriting master Jake Thakery in the shape of the Fake Thackray and a never to be forgotten evening when we ran the Martin Simpson Trio in the now lost and lamented Standard Music Venue, which was packed to the rafters for the occasion.